Three home run champions got together on one team Tuesday when Ted Norbert from Portland, Ore., arrived in the Brewers' Waukesha training camp. Norbert (left) won the 1942 championship of the Pacific Coast league with 28 home runs. Merv Connors (center) won the title in the Texas league with 27. Will Norman (right) led the American Association with 24. Connors will play first base; the other two are outfielders. 1943 was the Milwaukee Brewers' second full season under Veeck. In June of 1941 he and manager Charlie Grimm purchased the moribund franchise, which the season before had limped to a 58-90 record (35 games out of first place! ), and the two immediately began the work of turning it around. Within a year they had given Milwaukee a contender, as the Brewers finished 1942 with an 81-69 record, only a game and a half behind the pennant-winning Kansas City Blues. But they weren't done, not by a long shot. 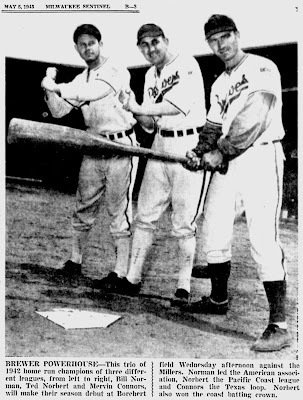 As the Brewers opened 1943's Spring Training, Veeck and Grimm were hard at work shaping a new squad. Note the reference to Waukesha; wartime travel restrictions had forced the Brews to move their camp from Florida to the neighboring county. Note also that Connors has rolled up his sleeves, obscuring the soutache trim; baseball fashion of the time was changing and longer sleeves were out. Many players cropped or otherwise modified the sleeves of older jerseys such as these, which had been introduced in 1939. 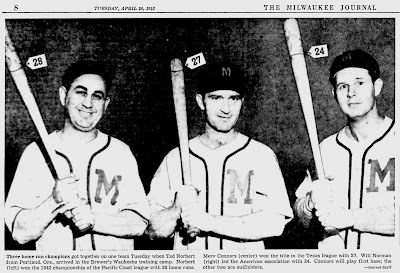 BREWER POWERHOUSE—This trio of 1942 home run champions of three different leagues, from left to right, Bill Norman, Ted Norbert and Mervin Connors, will make their season debut at Borchert field Wednesday afternoon against the Millers. Norman led the American association, Norbert the Pacific Coast league and Connors the Texas loop. Norbert also won the coast batting crown. Ted Norbert was every bit as good as his reputation. In 1943, he hit .293 with 25 dingers, good enough to win the American Association home run crown. His battery-mate Bill Norman came in second with 18. Their combined mark of 43 tied them with the entire Louisville Colonel roster and surpassed the combined team totals of the Indianapolis Indians, Kansas City Blues and Columbis Red Birds. Merv Connors wasn't so suceessful. He hit only 4 home runs before being sent down to the Memphis Chicks at the end of June. 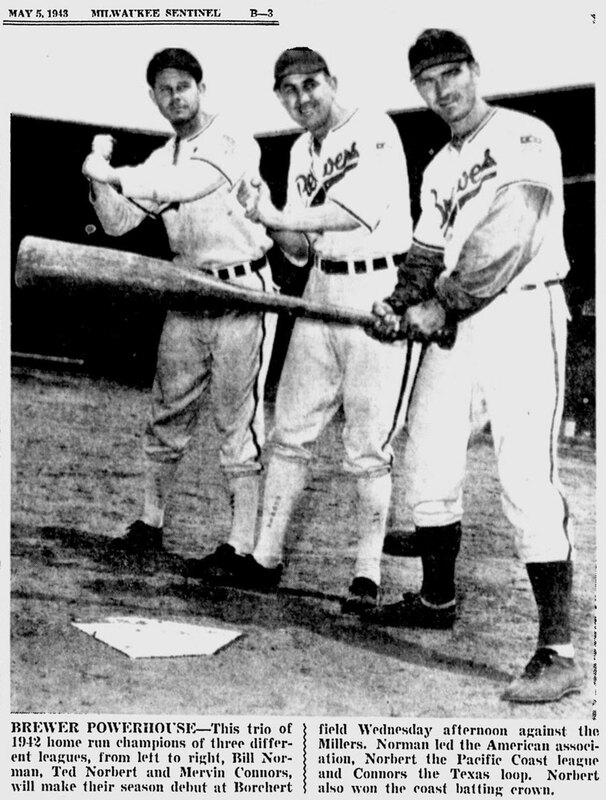 The Brewers, led by their two remaining sluggers, finally got over the top in 1943. They battled their way to an 90-61 record, good enough to bring Milwaukee its first pennant in seven years.